Heading out into the Gulf for another action-packed day with Southern Instinct Fishing Charters. Another hot, humid, late summer morning in Florida. Wednesday morning traffic was flowing on and off the Sanibel Causeway with people on their way to work and kids on their way to school. But the boys were headed out to play. We loaded up on Capt. Ryan Kane’s 36 foot Contender with a crew of ready fisherman including custom fishing rod builder, Dan James and John Anderson from Anderson’s Bait & Tackle. Off we went, cruising past Sanibel Island, cracking open some early beers, anxious to head offshore and see what we could find. Once we were out in the Gulf a little ways, the water turned deep blue and we began trolling. Almost immediately the reels started to scream as we were assaulted by barracuda, bonita, jack crevalle, mackerel and more. But then came the first real action of the day when Dan hooked a monster African Pompano. After the ensuing struggle, the fish was gaffed and brought aboard much to the delight of the entire boat. Round of beers anyone? Dan James from Dan James Rod Company holding his African Pompano! From there we chummed the waters and fished deep around the Captiva Blue Hole, getting hammered by several huge Goliath Grouper (aka Jewfish), who were more than eager to eat the live pinfish and grunts that were weighted and sent to the bottom. Everyone was getting broken off multiple times, but Wes Skinner, managed to wrestle two of these monsters to the surface. After a quick photo, they were released back to the Gulf. We also got some red grouper and snapper action which were added to the ice box. After trolling a couple more wrecks and finding plenty of action, we suddenly found ourselves in the middle of quintessential summer squall. Capt. Ryan had all the lines brought in and we hauled North to escape the storm. But not before we all laughed our way through the hard wind and rain and some 5 foot swells. The Contender is built to handle the rough waters offshore so after a slight diversion North and East, we made our way back through the calmer waters of Pine Island Sound and into Port Sanibel Marina, the sun just setting on another successful day on the water with Southern Instinct Charters. 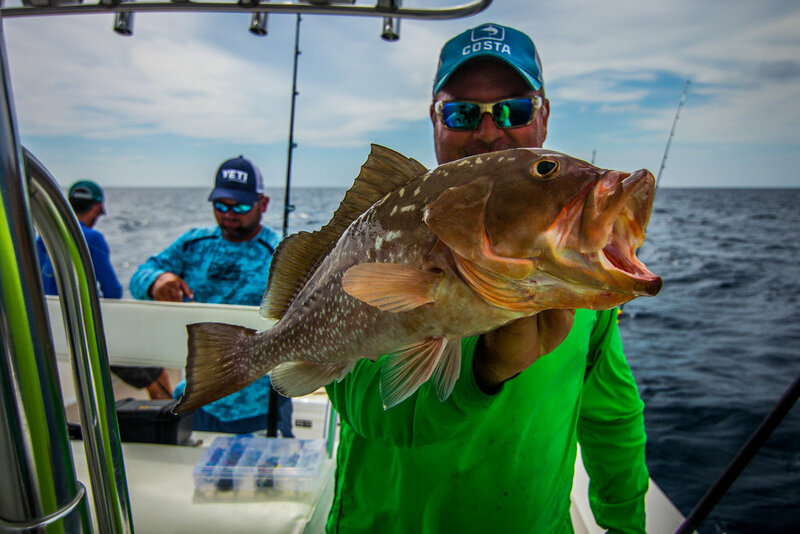 Come fish with Southern Instinct Charters for a fun-filled day of your own! Want to have an action-packed day of your own? Give us a call and tell us what you’d like to do! We’re running 6 days a week! Newer PostTotal Outdoor Pursuit TV Episode!